What do you do with a ton of Fennel? Harvest, preserve, cook, and make medicine! That's what! Last year, my husband brought a fennel plant home from the nursery. It was cute---small and fluffy with delicate fronds. We planted it in a large container in the garden, not realizing that it is a CRAZY growing herb! Weed, anyone? Well, I kept expecting beautiful fennel bulbs, but none ever appeared. There was just a long stalk, lots of fronds and pretty yellow flowers the bees loved. I chalked up that experience as a gardening flop. Then last summer, low and behold, I had a whole patch of wild fennel. I mean: It was HUGE! Instead of chopping it all down, I decided to do a little research on different ways to use it. Being an herbalist, I am aware that fennel has some wonderful healing qualities. It is great for the digestive system, it helps increase milk flow in lactating mothers, is a mild pain reliever, and may help with mild symptoms of depression. However, we had a LOT of fennel, and nobody is lactating around here, so I wanted to find some other ways to use this lovely plant! There are affiliate links scattered throughout this article. If you click through and make any kind of purchase, I may earn a very small commission at no extra cost to you. Foraging for wild fennel is not only fun, but yields you a really great herb to use in your cooking and for medicinal purposes. Find out how to identify fennel, how to forage for fennel, how to prepare it, and how to cook with fennel. Fennel looks beautiful (to me, anyway). It grows wild in some places (like California), and is tall----it grows to between three and nine feet. It is actually considered an invasive weed, so it is fine to use as much as you want or can! The scent of Fennel----Oh, my goodness! If you love the way licorice smells, you will LOVE the scent of Fennel. It has a delicate anise (black licorice) smell, and the bees absolutely love it, and so do I. I could stand there and just smell it all day! The taste of Fennel---Fennel has a strong, sweet anise taste, again, just like black licorice. It is used as a culinary herb, and adds a different, sweet and delightful flavor to many dishes. You can eat the seeds just for the taste alone! It's great as a breath freshener too! Fennel flowers all summer---these large yellow umbrels of flowers. I think it's a beautiful plant. It has tiny delicate fronds (somewhat like Dill) as well as leaves and a more woody stalk that holds the plant upright. The best time to harvest Fennel is in the early morning, when the plant is freshest. Carefully cut the flower umbrels and lay them flat. These tiny yellow flowers are often known as Fennel Pollen, and are a delicacy in very fine restaurants. It takes a lot of flowers to gather much of this yellow "pollen." The leaves and fronds should be laid to dry too. It doesn't take a lot of time for fennel to dry out, as the parts you want are quite delicate. After it's dried, I just store the fronds and flowers together and use mainly for cooking. As for the leaves, I chop these up and store them with fronds. I like to keep the flowers (pollen, as it is known in the U.S.) separate to use in salads or for a pretty sprinkle. If you want, after you chop up the leaves, you could just store all the parts together in an airtight container---or keep them separate---it's up to you. Here is one of the flower umbrels. When you have literally hundreds of these, it is quite a sight! Using a teaspoon or so of chopped fennel leaves, pour boilng water over in a cup. After steeping for 5 to 20 minutes (it gets pretty strong quickly), strain out the leaves and enjoy the tea! Fennel tea has been used for centuries to sooth the digestive tract, as it does have anti-spasmodic properties. Because of this, it is thought to aid with heartburn. In addition, it's a great urinary tract support herb and also helps with constipation. Being a diuretic, Fennel is also an aid for water retention. As you can see, Fennel is just an all around great herb for your entire digestive system. The tea is also excellent for lactating mothers who want to improve their milk flow. The chopped leaves and dried flowers and fronds add a nice taste to salad dressings and in meat dishes. It's great to help balance the strong taste of fish, especially salmon. "Angelo Garro's Wild Fennel Cakes"
"Strawberry and Wild Fennel Compote with Pound Cake"
There are many recipes online for using Fennel, however, these generally entail using the bulb. Since Wild Fennel (like the kind in my backyard) does not have a bulb, you need to find ways to use the stalk, fronds and flowers. The recipes above are all about using Wild Fennel. I say, "Explore!" There are so many ways to use Fennel. Fennel smells lovely. It is often used in essential oil blends and may help alleviate symptoms of menopause and PMS. If you have an essential oil diffuser and like the scent of anise or mild black licorice, you can diffuse it for the aromatic benefits. My favorite way to preserve Fennel is to infuse the dried fronds/seeds in Vinegars. The fronds can be placed in the jars and add a really pretty touch. You can use Fennel to make a medicinal tincture OR you can use it as a drink! Vodka is a great solvent in which to preserve your fennel. I found this recipe from the website, "Food52" and it is by Poppies and Papayas. Stir the sugar and water over medium heat until it thickens into a syrup. This takes just a couple of minutes. Lower the temperature and add the fennel seeds to the syrup. Stir continuously until the mixture crystalizes. They should look quite dry when this happens, and it will take place quickly. Here are some of the dried fronds. You can see how delicate they are! Here are the green seeds. At this point, they are very tender. As they dry, they will turn brown and become hard---not as fun to munch on, but very good for cooking. I hope you find delights in wild fennel as I do! I'm so glad that one little plant decided to turn into a huge wild patch of fennel and that I didn't inadvertently cut it all back! I am hoping like crazy it will come back this upcoming summer as strong as it was last summer! What are some of the ways you use fennel? Leave comments in the comments section! P.S. Remember to sign up for the Newsletter! When you do, you'll get access to the free password protected Resource Library with free eBooks, checklists, guides, and more! P.P.S. You may also be interested in reading these related foraging articles: Tips for Foraging and Wildcrafting Herbs Safely & Successfully, and LOTS more foraging articles on the blog! If you don't have fennel available, you can purchase freshly dried organic Fennel Here. 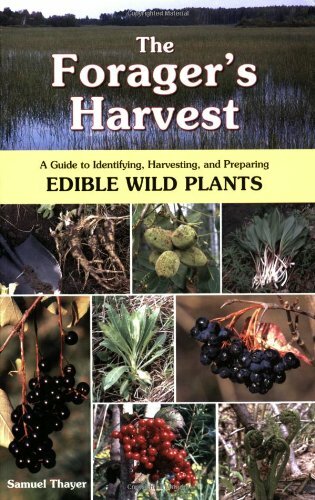 Here is a great book, in case you are interested in foraging for food! There are many edible plants living all around us! Learning to use them is an excellent step to take on your way to self-reliance!